We know new onset LBBB creates considerable anxiety . We experienced a reverse situation recently . A 72 year old man who is known to have chronic LBBB for over 5 years came to CCU with vague chest discomfort . 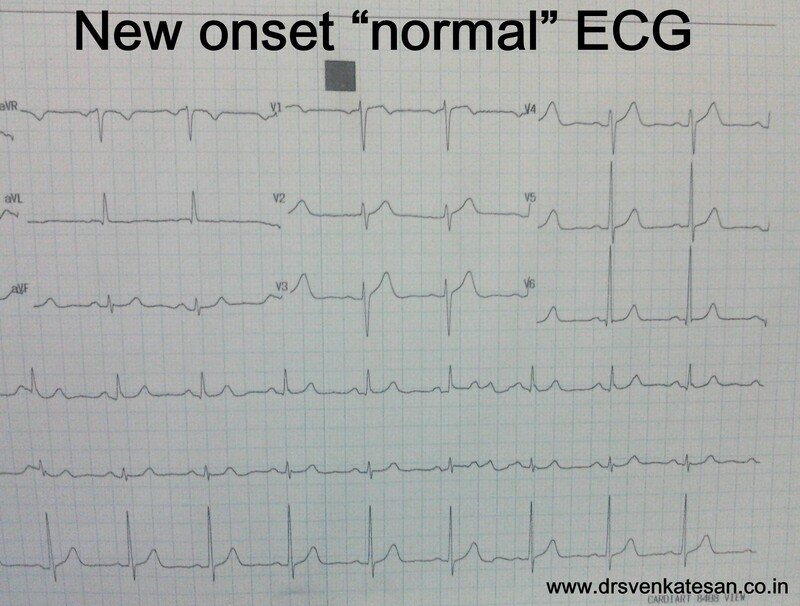 His ECG was perfectly normal . . . every one was curious ! My ECG always looked like this doctor ! Now you say it has normalised and you say it concerns you ! I am really worried doctor ! What does it mean doctor ? Cardiologist : I do not know . Any sudden change in rhythm even if it is from abnormal to normal is to be given importance . Patient : Is the going bad ? Patient : Should I get admitted ? Cardiologist : I think so but you need to undergo few blood tests and repeat an ECG . Patient : Oh what ? you are not sure either ! Are you not an expert in heart disease doctor ? Cardiologist : I think I am . I wish I have an answer to your question . This patient was admitted in intermediate care ward and observed for 12 hours . His enzymes and Troponin were negative . Echo showed normal LV function . He was discharged later and adviced a stress test . What is the the mechanism of normal ECG here ? Intermittent LBBB due to rate dependency is common .But this man had persistent chronic LBBB for > 5 years which got normalized .That mystified us ! Can transient ischemia of left bundle accelerate the conduction ? I’m surprised the cardiologist felt a need to get lab tests because of normalization of this patient’s QRS complex on 12-lead …. I understand that the patient had “chronic persistent LBBB” for 5 years – but all I know is that on the ONLY 2 tracings you show – the heart rate is faster in the tracing with LBBB – so we do NOT know (unless you can provide evidence over those 5 years of additional tracings) that his LBBB was truly “persistent” (and has not in fact been persistently rate-related over the previous 5 years after all …. ). And – even if you do provide a few tracings that show LBBB at a slower heart rate – one needs to remember that rate of “onset” of rate-related BBB is NOT necessarily the same as rate of “offset”. For example – you may develop rate-related BBB at a heart rate over 80/minute – but you may then need to get the heart rate to well below 80/minute in order for the BBB to go away …. (say down to 60-70/minute). Finally – many other factors (ischemia, electrolytes, hypoxemia) may account for predisposition to intermittent BBB – none of which we are given any information on …. So – IF this patient was truly asymptomatic from the somewhat slower current heart rate with which he conducts with normal QRS duration – so much the better. If if “ain’t broke – Don’t fix it”. Looking forward to hearing more clinical info on this patient from you (or perhaps additional ECGs during the past 5 years). THANKS for showing this interesting case! I hope he didn’t get a heart transplant and forget! It just goes to show, “complete LBBB” might actually be a harder diagnosis to nail down than many people realize. For an Electrophysiologist, that’s easy!!!! 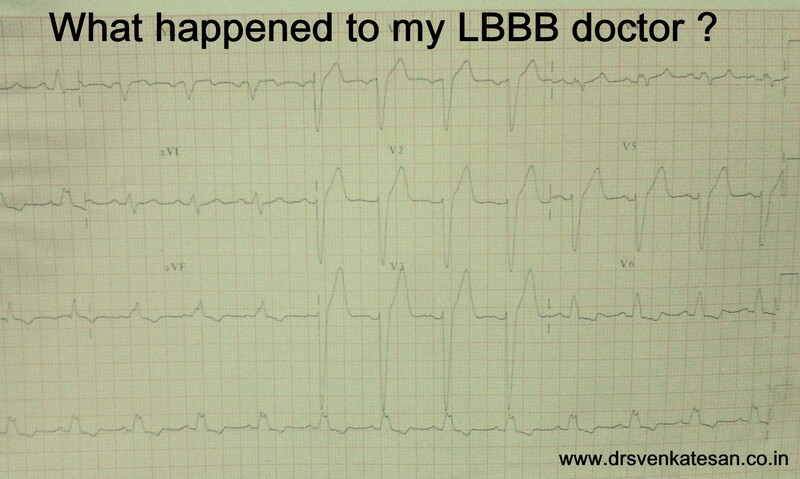 The LBBB does not mean complete block of the left bundle. It may be only a delay in the activation of the left bundle that gives the same surface QRS morphology of LBBB. The other explanation is retrograde concealed penetration of the left bundle through the septum. Of course there are other causes of intermittent left bundle branch block, but ischemia is not one of them!!!! [can you tell me which artery is supplying the left bundle?] Did any one see a case of acute ischemia presented as transient complete left bundle branch block? I bet no one. Back to our case: If the first scenario was the case, then any delay in the right bundle will lead to simultaneous delay in both bundles and will lead to normalization of the QRS. If the scenario is the second one, then any PVC from the right ventricle will lead to retrograde activation of the right bundle and hence will stop the concealed penetration of the left bundle through the septum. Therefore, the QRS will normalize. This is called peel back phenomenon. I hope this can help to understand this phenomenon. @Raed – Doesn’t the left bundle branch (at least its initial portion) primarily receive its blood supply from the LAD? I apologize if my question is naive – but I don’t understand why compromised blood flow (as may occur with ischemia) couldn’t at times have some effect on conduction properties? Thanks for your elucidation of this.